!! 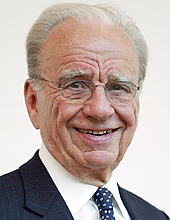 Rupert Murdoch is buying the WSJ !! This season the Wall Street Journal is the new New York Post! Rupert Murdoch is poised to purchase Dow Jones & Co., the publisher of the WSJ, for a modest $5 billion. He claims he will not turn the venerable paper into yet another outlet for Republican propaganda (though much of the editorial already leans that way), meaning little will change except for a few lay-offs. Time will tell, I guess… It’s hard not to trust such a wrinkly, cute face. 2 Comments on "Rupert Murdoch is buying the WSJ"
More accurately, Murdoch _wants_ to buy Dow Jones, which owns the WSJ, but whether or not he “is buying” it has not been determined.